Confidentiality Notice: This e-mail and any attachments may contain privileged, confidential and legally protected information. If you are not the intended recipient, please be aware that disclosure, copying or use of the enclosed information is prohibited. If you have received this message in error, please return it to the sender and delete this copy from your system. Thank you. Thank you for your well wishes! I wish you could have been there, too. We had absolutely perfect weather and a great turnout. Everybody seemed to thoroughly enjoy the birds, programs, and children’s activities. 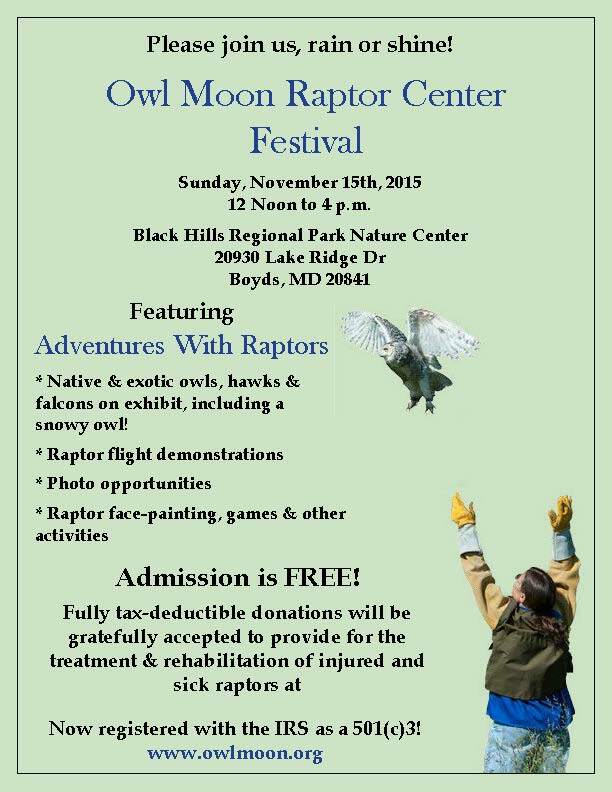 Our guests were kind and generous and we raised roughly $5,000 to provide for the care and treatment of injured, sick and orphaned birds of prey at Owl Moon Raptor Center. All in all a great success! We would love it if you could join us next year. We are thinking of having both spring and fall festivals in 2016. Hope you can come!